This grilled, sweet tea brined pork tenderloin is an amazingly simple and delicious weeknight dinner! 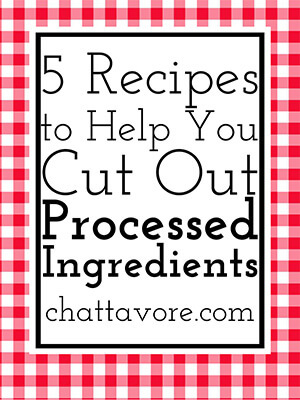 It only takes about 15 minutes of active prep/cooking! Scroll down for video. Those of you who know me well know that this blog is chicken thighs and pork shoulder, not chicken breasts and pork tenderloin. I am a firm believer in a couple of principles: (1) fat is flavor; and (2) moderation is the key to eating whatever you want. I decided a long time ago that I was willing to eat a little bit less of something if I thought it tasted better or had a better texture than the thing that I could eat more of. Did that even make sense? I feel like I was ramblinnnnng. Sorry about that. It happens sometimes. The thing is, another principle that I live by is never say never. I actually don’t have anything against chicken breasts and pork tenderloin, I just happen to like thighs and shoulder a little bit more. Here’s the thing about pork shoulder, though: as much as I love it, it is a bit of a pain to cook. I mean, it’s easy enough. Low and slow, you know, or you can do it in the Instant Pot and that goes pretty quickly. However, this is the summer of grilling for me, and I was certainly not going to be tending a pork shoulder for hours on the grill or in my smoker. Sooooo…if I was going to grill some pork, tenderloin or chops seemed to be the way to go. I am sure that most of you have heard of sweet tea brined fried chicken. One of my favorite places to eat fried chicken here in town, Public House, brines their fried chicken in sweet tea and it is 💯🙌🏻👏🏻. I like to let other people fry chicken for me, though, so I knew that I wasn’t going to go there. A sweet tea brine, though, seemed like the perfect way to season a grilled pork tenderloin and keep it good and juicy. And you know what? IT WAS. 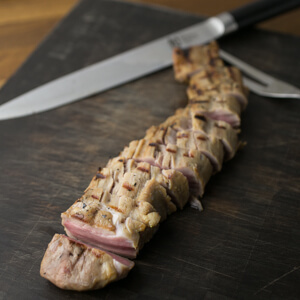 Another way to keep your grilled pork tenderloin from drying out is to not cook it to death. DID YOU READ THAT? You don’t have to turn your pork into shoe leather to safely eat it, regardless of the rumors that you may have heard. You want to cook it to an internal temperature of about 140˚ and then let it rest to redistribute the juices and allow just a little bit of residual cooking. Listen to me and your pork will be just a little pink, but totally safe to eat, and so tender you won’t believe your taste buds. Click here to save this recipe on your Pinterest pork or grilling boards! This sweet tea brined grilled pork tenderloin deserves a spot on your dinner table. Trust me. The brining takes 5 minutes of active work, then 10 minutes of grilling, and quick rest, and dinner is on the table. I even threw some broccoli on the grill for a perfect side dish. Try it! In a container large enough for the pork tenderloin, whisk together the sweet tea and the salt. Place the tenderloin in the container, cover, and refrigerate for 12-24 hours, turning once. When you are ready to grill, remove the tenderloin from the brine. Pat dry with paper towels and let stand at room temperature while you prepare the grill. Preheat the grill to high. Generously brush the grates with oil. Grill the tenderloin for 10-12 minutes, turning every 2 minutes, until the tenderloin reaches an internal temperature of 140?. Remove the tenderloin from the grill and wrap tightly in aluminum foil. Rest wrapped in foil for 10 minutes. Slice and serve with BBQ sauce if desired. Prep/cook time does not include inactive time to brine or rest the tenderloin. To make sweet tea, boil 1 cup water and steep a family size tea bag in the water for 5 minutes. Add 1/2 cup sugar and stir until dissolved. Add 3 cups cold water and refrigerate until cold. Thank you for supporting the brands that keep Chattavore running! 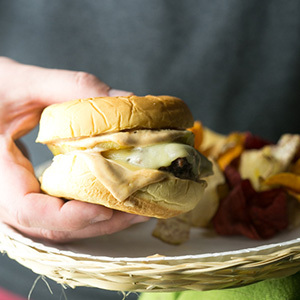 This grilled teriyaki burger with pineapple and white sauce is a delicious way to celebrate Memorial Day weekend! Did you know that May is burger month? I mean, in my world, every month is burger month…but May is like official, capital letter Burger Month. I’m not really sure why, but maybe it’s because May is the month that sort of takes us into (unofficial) summer with Memorial Day weekend? I’m going to let you guys in on a little secret. Okay, not so secret, but whatever. This is my last week of work for a while! School is out on Friday and I get to be a full-time blogger for two months🙌🏼. What better way to celebrate than a holiday weekend? Memorial Day grilling doubles as start-of-summer-vacay grilling for me. And I know that I mentioned here a couple of weeks ago that learning to grill was one of my goals for the summer. I think before now I have used my grill exactly once, and that was pretty much Philip getting everything started and me just going out and turning the chicken (or whatever it was). After this summer, Imma be a grilling pro! What better way to start than this grilled teriyaki burger? Kikkoman®Teriyaki Marinade & Sauce kicks up the flavor in my teriyaki burger to eleven (where are my Spinal Tap fans???) and a slice of pineapple on top rounds out the sweet and savory flavor of the burgers perfectly. Oh, oh…and my white sauce, with Kikkoman®Traditionally Brewed Soy Sauce, is the perfect way to sauce up this teriyaki burger. I have to admit, I’ve been a soy sauce addict most of my life – my dad has been dousing everything from steak and chicken to vegetables and casseroles with Kikkoman®Traditionally Brewed Soy Sauce since I was a kid, so I’ve never been short on ways to include soy sauce in my cooking, and not just my Asian-style cooking. KikkomanUSA.com has lots more great recipe ideas using their awesome products! And if you’re like me and need more summer grilling inspiration, click here! Like I mentioned last week, the Walmart Neighborhood Market near my house has become one of my go-to stops for groceries (I love their grocery pick-up option during weeks that shopping for groceries makes my busy brain hurt). I stopped by there to pick up my Kikkoman®Teriyaki Marinade & Sauce and my Kikkoman®Traditionally Brewed Soy Sauce (I love that fun little bottle like you always see at your favorite Chinese restaurants). For a coupon for Kikkoman®Teriyaki Marinade & Sauce and Kikkoman®Traditionally Brewed Soy Sauce, click here! In a large bowl, combine the ground beef with the Kikkoman®Teriyaki Marinade & Glaze, taking care to not overwork the meat. Divide the meat into 6 portions and gently form each portion into a patty, pressing a deep indention into the center of each patty. Heat one side of the grill to high and one side to low (if using a charcoal grill, arrange the coals to create a high heat zone and a low heat zone). Place the burgers on the high heat zone and grill for two minutes, then move to the low heat zone and grill for 3 minutes (for medium-rare burgers) to 5 minutes (for well-done burgers). During the last minute of cooking, place the pineapple slices on the cool area of the grill and top the burgers with the cheese slices. Spread each bun bottom and top with half a tablespoon of white sauce. Place a burger and a pineapple slice on each bun bottom. Top with bun tops and serve immediately. If you don't have a grill, you can cook these burgers on your stovetop. A cast iron skillet is ideal for this. Preheat over high heat. Cook for 3-5 minutes on each side, adding the cheese in the last minute of cooking. Remove the burgers from the pan and cook the pineapple slices for about one minute each. Sauce and serve the burgers as directed in the recipe.